Product: Pork Head • Cheeks intact. Listed prices are approximate, based on larger lb. per package. Final cost will be adjusted based on actual weight. Size: packaged individually 22-25 lbs ea. Prices listed do not include shipping and handling cost. Shipping of frozen product in gel iced, insulated carton is available to CA, NV, UT, AZ, OR, WA, ID, CO, NM, MT, WY, TX, OK [see Shipping (Pork Products) for UPS rates and options]. Product may also be delivered in the Buellton – Santa Barbara area by special arrangement. Shopping — your cart will add and display your selections on each product page below. You may continue to shop and add items to your order until you wish to checkout. 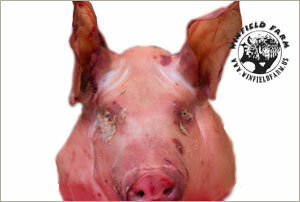 Use the dropdown list under Mangalitsa Market for quick access to our products. PLEASE CALL 805.686.9312 BEFORE ORDERING ONLINE TO ENSURE PRODUCT IS AVAILABLE. We supply Mangalitsa pork to local restaurants and some cuts are in high demand. Also not all sausage flavors are available all the time, but can be custom ordered. We will of course refund any portion of an order placed that we cannot fulfill, or with your approval we may substitute product of comparable value. However, to ensure and simplify your order, please contact us first, before placing your order on PayPal. Don't forget, you can pre-order particular cuts or sausage flavors and we can have pigs custom processed to your specifications. Just email us your preferences. Processing is seasonal, typically spring and fall. Thank you for your interest in Mangalitsa pork.